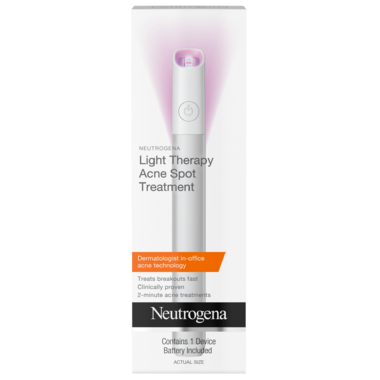 Neutrogena Light Therapy Acne Spot Treatment harnesses the power of light therapy to target and treat breakouts quickly. Clinically proven to speed the reduction of breakouts, this acne spot treatment uses red and blue light to swiftly treat acne without flaking or burning your skin. Its patent-pending design allows light to surround the pimple for effective, targeted treatment: blue light kills acne causing bacteria and the red light reduces inflammation to deliver fast results. The easy-to-use, portable design is ideal for on-the-go acne treatment, and leaves behind no mess or residue. Targets and treats acne without residue or mess. Uses both red and blue light therapy. Instructions for Use: Treat for 2 minutes, 3 times a day. Caution: It is not recommended to use the Neutrogena Light Therapy Acne Spot Treatment if you are pregnant, may be pregnant, or nursing, as the device was not tested on pregnant or nursing women. I love this wand tool. Easy to use and it works well. May need to use a few times on an area but it is very effective.